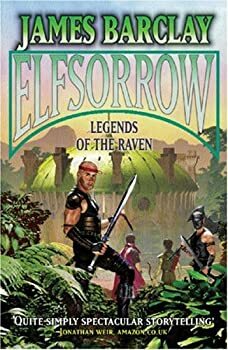 Elfsorrow is the first book in The Legends of the Raven, James Barclay’s second series about a group of mercenaries called the Raven. If you have not read the previous series, The Chronicles of the Raven, you are going to end up guessing at much of what is going on. If I had it to do over again, I would have read the previous series first; based on all the information that I had to figure out from context, it sounds like a great story. Elfsorrow takes place on two different continents and tracks about four different storylines. 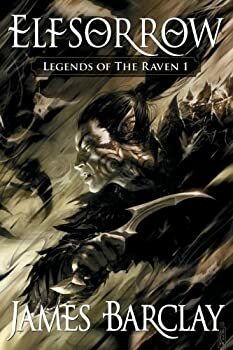 The first features a group of highly skilled mages and fighters who work as a group known as the Raven. The Raven is made up of many different interesting characters, including a female mage who has just lost her child, a former general in the army of one of the Magic Colleges (think an order/school of magic), a shapeshifter who has returned from being a wolf and is still getting used to being human, and a former soul-sworn warrior from a different Magic College. These characters have lots and lots of backstory that I didn’t know, but they still fascinated me. The second storyline focuses on a fanatic rabble-rouser who is trying to turn the populace of one continent against all magic users. Again, there is more to his story than Elfsorrow tells but, clearly, his motivations and convictions are heinous. The phrase “the end justifies the means” sums up his worldview. The third storyline is about a group of Elves who are guarding a magic shrine/temple in the heart of the second continent. They are elite warriors and combat magi whose dedication to what they are doing makes them very prejudiced. It’s a believable combination, and their storyline is almost tragic. The fourth storyline chronicles an expeditionary force seeking after artifacts and other sources of magic. Their motivations are obscure at the beginning, but even as you grow to dislike what they are doing, there are characters in the midst of this storyline who are admirable and honorable!! Very good stuff! I really liked Elfsorrow because James Barclay does things that I have not seen in a long time. He takes time to incorporate tactics and strategy into the combat situations. He does not neglect details like camouflage and positioning of different types of combatants and the effects of spells on an opposing force. If you like detailed fantasy, this is a really good book. You may, however, want to read The Chronicles of the Raven, starting with Dawnthief, first!